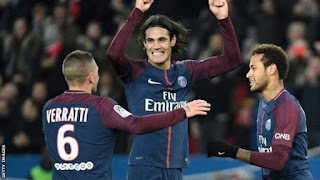 Chelsea are eyeing a move for Paris Saint-Germain star, Edinson Cavani if they eventually sell striker, Alvaro Morata to Juventus this summer. Tuttosport reports that there is no deal in place between the Blues and Juve for Morata, but the Premier League champions are already looking ahead to sign a replacement for the Spaniard in the person of Cavani. According to the Italian newspaper, Morata’s representatives on Monday had come to an agreement with Juventus, with the 25-year-old willing to take a pay cut to push through a deal. The report added that the Serie A champions are not willing to spend more than £60million for the former Real Madrid star. Morata has scored just 11 goals in the Premier League this season for Chelsea. Meanwhile, Cavani has scored 28 goals for PSG in the Ligue 1, the highest total in the division. The 31-year-old has fallen out with Neymar, who moved to the Parc des Princes in a world-record deal last summer. Chelsea would likely have to compete with Atletico Madrid and Juventus over his signature.